Actually, 11 years rather than 10 years separate these two photographs, but that doesn’t make for a nice alliterative title! 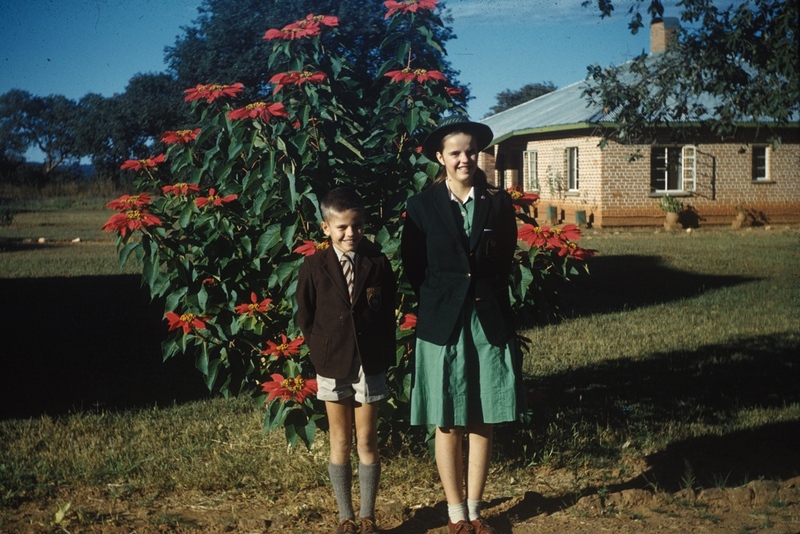 In the first photo, I am dressed in my Townsend High School uniform, probably just before my brother (in his Hillside School uniform) and I left Macha Mission to travel by train to Bulawayo for school in 1961. 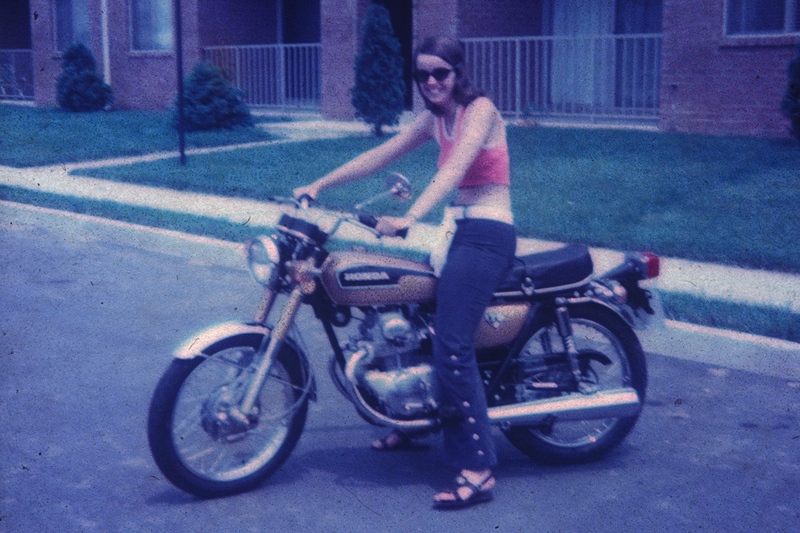 In the second photo, taken in the summer of 1972, I’m posing in “hippie” clothes with Dale’s new motorcycle in front of our first apartment in Mechanicsburg. The obvious reason for the difference between the me in the first photo and the me in the second one is the passage of time – from age 13 to age 24, from adolescence to adulthood. As I look at these two photos, however, I see more than the normal passage of time; in fact it feels more like a lifetime. Knowing what I know now about myself, I see the transformation of a young and very shy, awkward, innocent, and naive teenager into a considerably more mature, worldly-wise, and self-confident young woman. It’s a transformation that didn’t come easily. I’ve told the story before about my “re-entry” into American culture at age 13, and the difficulty of that transition. I came to the U.S. from Africa having spent the previous five years in three different schools – wearing a uniform to school every day, living a relatively regimented and ordered life, not really being allowed to express my own individuality. During school breaks, I was home out in the proverbial boonies on missions stations (three different ones – we moved a lot! 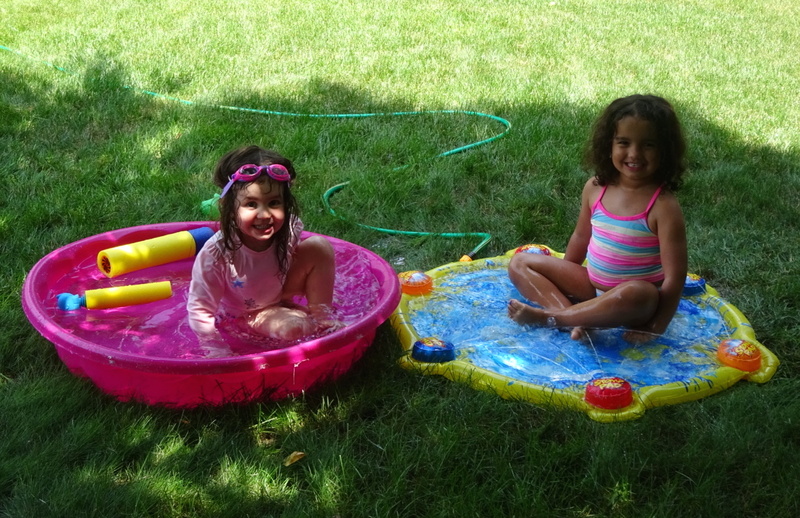 ), playing with dolls, sewing and knitting doll clothes, reading, playing with my little brother and other missionary kids, riding bike – and largely oblivious to what life was like in the U.S. I was completely unprepared for my introduction to high school in the U.S. Yes, I was prepared academically, but socially I was clueless. Throughout high school and college, I struggled with self-esteem, and often felt ugly. I tried really hard to fit in, especially in how I looked and dressed, but I had no experience or know-how (and no money), and I was too introverted and embarrassed to ask even my best friends. I learned mostly by watching and imitating. I did not date because no one asked me out, which intensified my feelings of inferiority and rejection. On the positive side, I made friends and did well in school. My parents valued education, and encouraged my school success and pursuit of a career. I made it through high school, college, and graduate school, and got my first full-time job as an English teacher at the high school from which I had graduated only six years before. Most people would not have had any idea of how much pain I was in emotionally. Sometimes I didn’t recognize it myself. Even when I allowed the pain to rise to the surface, I covered it up and put on a brave front, which I was good at because, after all, I did have some competencies and my mother always modeled stoicism very well! While I was in graduate school, Dale came into my life. I had known him in college, but the trajectory of my life changed when we started writing to each other while he was in voluntary service in Zambia. Our relationship blossomed over the year and a half between the time I sent him a Christmas card in December 1968 from my graduate school outpost in Idaho and he returned to the U.S. in August 1970, but I still didn’t know what would happen when he returned and we finally saw each other face to face. Those feelings of self-doubt were very close to the surface as we met awkwardly for the first time as boyfriend and girlfriend (I hoped!) at the old Harrisburg airport. And then the love that had begun in those letters deepened as we spent time together, got engaged, and then married in June 1971. That girl in the first photo could never have imagined in 1961 that in a mere 10 years, she would be married and look like the girl in the second photo. My high school senior picture taken two years after “uniform girl” shows the beginning of the transformation, but you can still see the naivety and innocence in my eyes and general demeanor.”Uniform girl” had difficulty blending into American culture in the early 1960s; by the early 1970s, “motorcycle girl” could almost pull it off! “Motorcycle girl” – in her bell-bottom jeans, sleeveless crop top, and long straight hair – looks like she had almost completely acculturated. Some might think that’s a bad thing – especially those conservative, plainly-dressed folks in my church – but to me it represents an important and positive sea change in how I began to view myself. 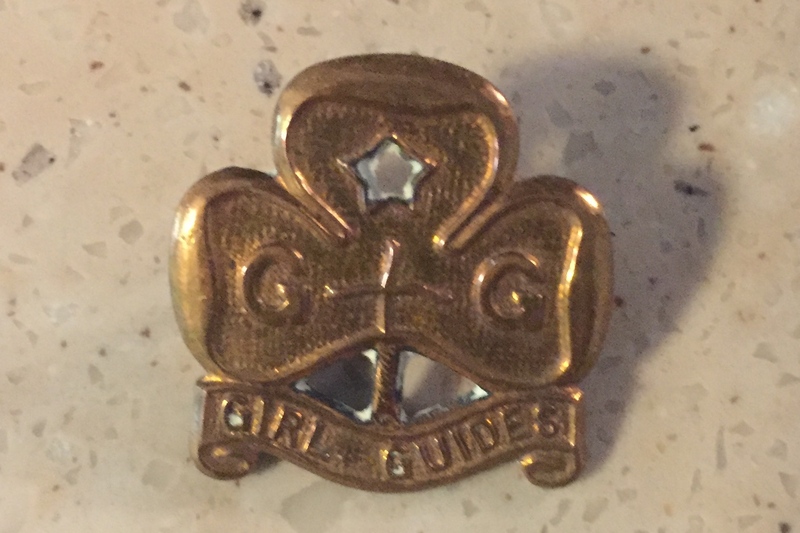 “Uniform girl” had a generally happy and interesting childhood that I wouldn’t trade for a different one, but I was ill-equipped for the culture into which I was thrown at age 13. I had been sheltered in so many ways. And most significantly and painfully, I felt very much alone. For a variety of reasons, I didn’t know how to talk about what I was feeling, or how to get help. My parents, though I know they cared deeply and understood some of what I was going through, were themselves ill-equipped to help. So I muddled through mostly on my own. A measure of the emotional pain I stifled during those years is how easily I can still feel it. The self-consciousness that was my constant companion then is something I still have to actively work to overcome. I still struggle sometimes with the social anxiety that was so real in those days. I’ve been delving into family history lately, occasioned by an event and a suitcase. In November 2015, Harriet Bohen Bert, my mother’s last remaining sibling and for whom I was named, passed away at the ripe old age of 98. My father’s siblings are all gone too, so Aunt Harriet’s death marked the end of a generation. Some years ago, Aunt Harriet wrote her memoirs, and recently one of her sons loaned his copy to me. I read the memoir with interest (each typewritten page carefully preserved in a plastic sleeve and inserted in a binder), especially the sections where she recalled her early life with her grandparents, parents, and siblings, including my mother. Following Aunt Harriet’s death and the family reminiscing that ensued, I took temporary possession of a vintage suitcase of old photos that my brother has had ever since we cleaned out our parents’ home at Messiah Village many years ago. The photos were not organized in any way, just stuffed into the suitcase for safekeeping and because it didn’t seem right to throw them away, so my first order of business was to sort them into categories: my mother’s side of the family; my father’s side (two categories here because of the number of photos – his mother’s Steckley family and his father’s Sider family); my immediate family (my parents and siblings); school and other photos of their six grandchildren (my children and nieces and nephew); and random/unknown people and a few smaller categories. Some of the photos I could easily identify, some had names written on the back, but quite a few were unidentified in any way. 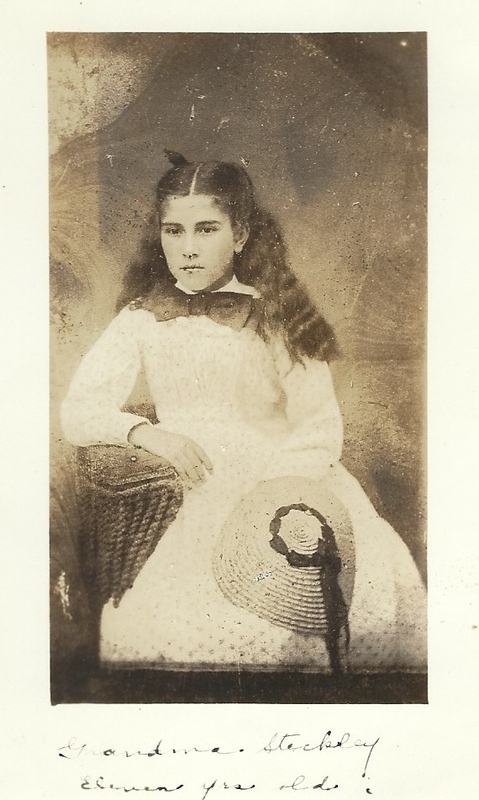 The oldest photo I found was of my paternal great-grandmother, Sarah Heise Steckley, which was probably taken around 1871 when she was 11 years old (see photo). 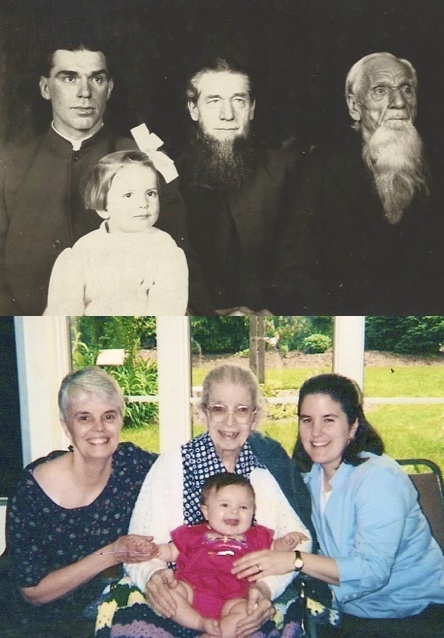 A treasured photo combo: seven generations of Bohens. Top photo (circa 1914) from left to right: Walter (my grandfather), Herman (my great-grandfather), and Jodokus (my great-great-grandfather), with my mother Gladys Bohen Sider on her father’s lap. Bottom photo: My mother, daughter, granddaughter, and me at my dad’s funeral in 2003. Almost 90 years separates the two photos. I am fortunate in knowing from whence I came. On both sides of my family, I can trace my ancestors back to Germany. My father’s side: According to the genealogy book, Two Hundred Years with the Siders, a man named Georg Seider arrived in Philadelphia from Germany in 1752. His son Jacob, thought to have been born about 1758, married Maria Wenger, a Mennonite woman, in Lancaster County, Pennsylvania. In 1788, Jacob and his brother-in-law and their families became part of the first generation of River Brethren (later Brethren in Christ) and emigrated to Canada in 1788. I am a direct descendant of Jacob; he is my quadruple-great grandfather. My mother’s side: Jodokus Theodore Bohen was born in Germany in 1827 and emigrated to the United States in 1854, settling in Illinois. After his wife’s death, he moved to Kansas, where he lived with his son Herman until his death in 1917. Herman’s son Walter was my mother’s father (see four-generation photo, top left). My maternal grandmother’s Book family ancestors emigrated to America in 1769, also from Germany. The Book family, including my great-grandfather Adam Book who was born in 1858, lived in Lancaster County until 1877 when they moved to Kansas. Clearly, I have a strong German heritage! My active involvement in the Brethren in Christ Church is not surprising, given the fact that my maternal and paternal grandfathers and great-grandfathers were all ministers in the church, with my two paternal great-grandfathers also serving as bishops. Letters from my Grandpa Sider to my father after he left home are filled with church news (see my blog post, “The Grandfather I Never Knew”), and a 1919 letter I recently discovered in the suitcase from my Grandma Sider (written only about a year before she died) to her sister in Pennsylvania also includes church news. Both testify to the important place the church and Christian faith had in their daily lives, which continues for me. I wish I had asked more questions when I had the chance, when my parents were still living. 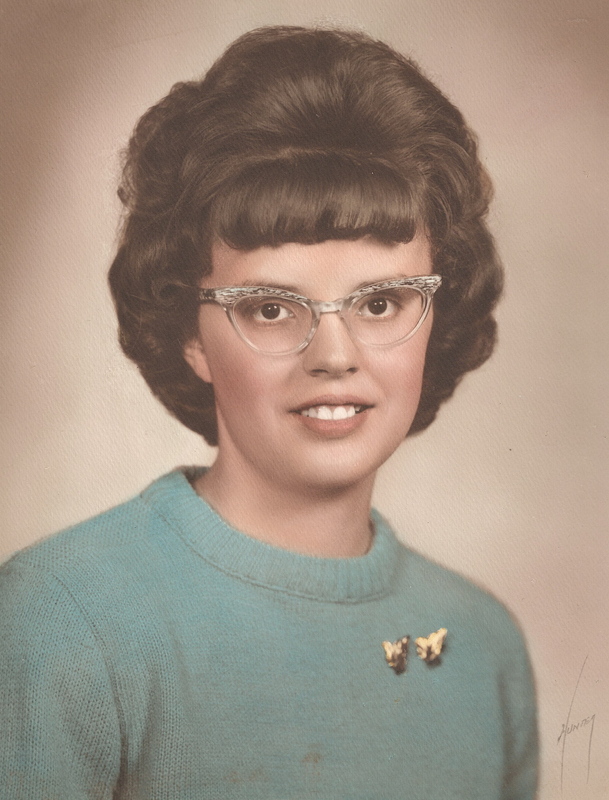 My dad wrote his memoirs (focusing on his missionary career), so I have some of his perspective on his life, but I wish I had asked my mother more about her early life and her perspective on how her life unfolded. She might not have told me the whole truth, because she would have worried about how what she said would affect other people, but I should have asked. I wish I had recorded some of their stories. I especially regret not having either recorded or written down a story my mother used to tell about her family’s move from Kansas to California in 1923. She and her two oldest siblings traveled with their father by car, while her mother and the three youngest children traveled by train. She used to describe in graphic detail the harrowing aspects of that car trip, including doing her 12-year-old best to keep her brother quiet so he wouldn’t bother their dad with persistent questions while he drove, a motel fire one night, and the meager amount of food they had for the journey (they were very poor). She also talked about how they arrived at the Upland Brethren in Christ Church in California on Thanksgiving Day looking quite bedraggled and dirty, and how the church people welcomed them warmly. Fortunately, my Aunt Harriet wrote a short account of the family move to California which preserves many of the details, but it’s still not the same as that first-hand account I could have recorded from my mother. These regrets are a reminder that I need to write more of my stories as a legacy for my children and grandchildren (and perhaps a nudge to them to ask me questions!). Photographs need to be identified by date, location, and the people in them! While some of the photos in the suitcase had information written on the back, many of them didn’t, and I’ve had to rely on my own family knowledge or consult with family members who are still living. Identifying printed photos is one thing, but one also wonders what will happen to all the hundreds and even thousands of digital photos we store on our phones or upload to our computers. They’re easy to access and share now, and in many cases are floating out there in cyberspace, but what about 50-100 years from now, when my grandchildren and great-grandchildren are wondering about their ancestors? One thing I’ve starting to do with old printed photos that I scan to the computer is include a description in the file name and documentation, but I still have a long way to go. Did my parents wonder whether their children would ever care about this suitcase of old photos? I know I wonder sometimes how much my children will care about all the mementos of the past that I’ve saved, and whether they care as much as I do about our family history. 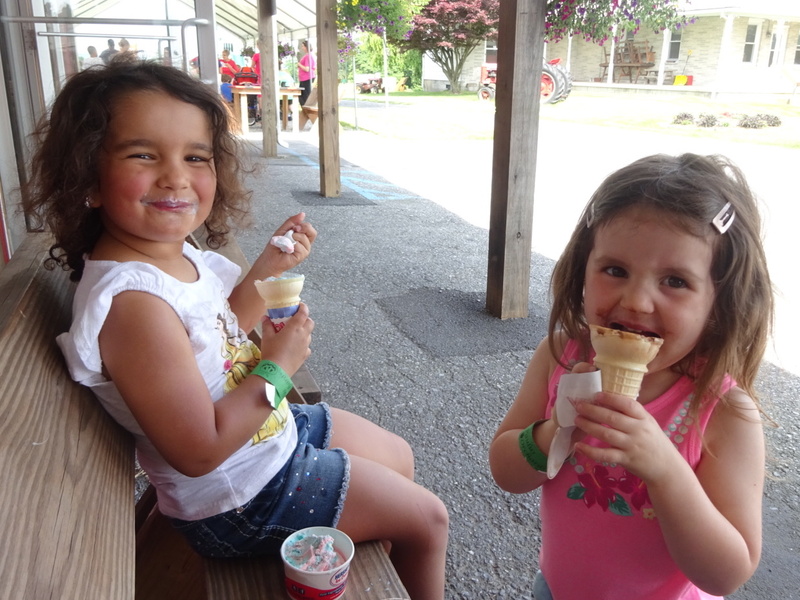 I have been amazed at how Alecia, my oldest grandchild, likes to figure out and know where she fits in the extended family. She’s able to understand complicated family relationships that stump many people (like second cousin once removed, etc.). Recently, I was showing her a photo of a large group of college students in 1932 that I found in the suitcase. I had not been able to identify anyone in it until I did some research. I couldn’t even find my own mother in the photo because the faces were so tiny and difficult to see. Within seconds of looking at the photo, however, Alecia correctly pointed out my mother. So maybe there’s hope that the family legacy will continue! 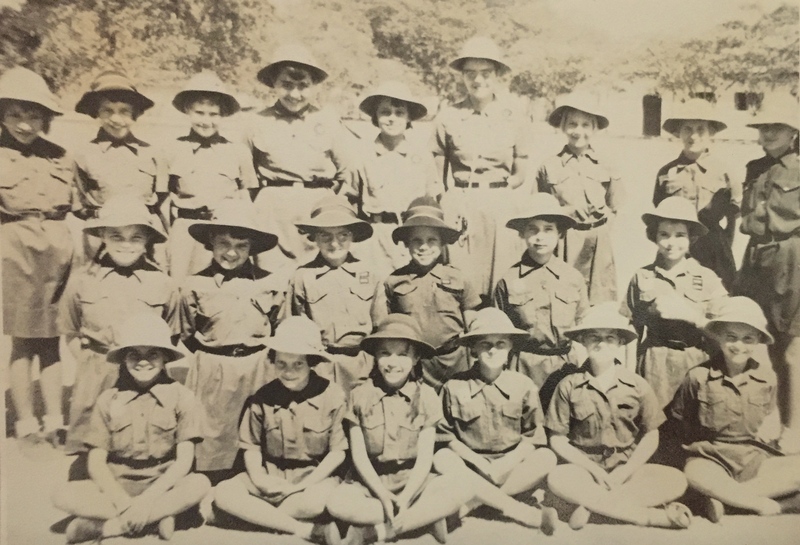 (See this blog post on the Brethren in Christ Historical Society’s website for information about the photo.) Maybe Alecia’s name – a form of Alice which is my middle name and the name of my paternal grandmother – is a sign that she will be the one to continue to preserve family history! Can I bequeath that responsibility to her?